LG 32LN575V review | What Hi-Fi? The LG 32LN575V TV is a bit of a jack-of-all-trades. 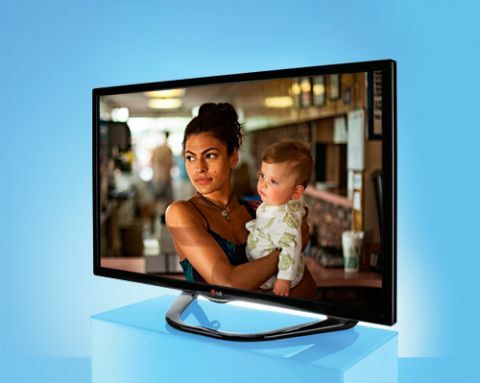 It gathers all the main features you’d want in a smart TV – from a Full HD screen and network connection, to video on demand services and smartphone compatibility – and packs them into a 32in screen that costs a competitive £400. Samsung currently rules the roost when it comes to catch-up TV, but LG has the upper hand with movies thanks to its LoveFilm, Netflix and Blinkbox apps, and the fact LG is the only TV manufacturer with the Now TV app. You also get BBC iPlayer and YouTube to catch up with TV and cat videos, while social apps (Facebook, Twitter, Skype) and a web browser round-up the internet content available on the Premium Apps portal. The Premium section – a panel of thumbnails for all the apps available on the LG 32LN575V – is a colourful and intuitive interface where you can also download a variety of games and news apps. Press the My Apps button on the remote (or control app – see below), and a panel pops up from the bottom of the screen with only a selection of apps for quick access. It’s a very easy-to-watch screen, with a decent colour balance and good level of detail. It might not be the most impressive picture, but its noise-free and comfortable approach across Blu-rays and standard Freeview channels makes it watchable. The 32LN575V lacks the absolute clarity and subtlety found in rival sets such as the Philips 32PFL4258T and the Panasonic TX-L32E6B: its black levels aren’t as deep or textured, and there’s a slight yellow tinge to the palette. That yellowness makes the picture look a little anaemic at times, and with the lack of subtlety, it doesn’t come across too lively. Skin tones in particular look sallow, and blacks end up grey and muddled at times. Unlike the Sony KDL-32W653A, which has clean whites despite a similar way with skin tones, the LG isn’t quite as stark. James Bond’s shirts don’t look as crisp and white in Skyfall, while the Victorian setting in the Guy Ritchie/Robert Downey Jr Sherlock Holmes DVD looks a touch too sepia-toned. When we start testing a TV we tend to keep picture-processing turned off at first. This lets us assess the screen’s basic character before we gradually add the effects. In this case, turning Super Resolution to ‘Low’ does add a little more punch and depth to the picture. This is quite a loud and brash-sounding TV, but it isn’t the thin or sibilant sound we’ve come to expect from flatscreens. This must be partly due to the LG’s chunkier build. It isn’t a subtle sound, but on the plus side it has weight and doesn’t grate too much on the ears. Delve into the audio settings and there’s a pretty exhaustive list of options to tweak. We’d steer clear of turning on the Smart Sound Mode, Clear Voice or Virtual Surround Plus, but Sound Optimizer is useful. Set it to Normal, Stand or Wall Mount depending on how you position your TV to get a clearer, more cohesive sound. Bad news if you’ve spent hours meticulously ripping your CDs into a high-quality digital archive: the 32LN575V doesn’t support WAV or FLAC audio files. Better news if you’ve done it slightly lower-fi, though, because it can handle AAC and MP3. Your home network needs to be stable to keep your media streaming steady and smooth – LG offers both wired ethernet and built-in wi-fi options on this TV. The SimplyShare portion of the smart portal shows all your connected (physically or wirelessly) devices, be it a USB hard drive, a NAS device, laptop or smartphone. One of the LN575’s three HDMI inputs supports MHL (Mobile High-definition Link), so you can connect your Android smartphone directly to play HD content stored on it. On the other hand, Miracast support means you can stream music wirelessly straight from a compatible Android device. Three USB ports means you can use at least one of them to record TV programmes, while analogue connectivity is catered for with composite, component and RGB Scart inputs. There are also digital audio and headphone outputs. The remote control and LG’s interface share a similar feel: they offer everything you’ll need and are perfectly fine, except they can feel cluttered. The petite handset is nice to hold, although the small buttons can sometimes be fiddly. The colourful interface is easy to use, but we can’t help feeling it looks a little dated. The thumbnails feel crowded and even the settings menu lacks polish and simplicity. The experience isn’t as sluggish as the Toshiba 32L6353’s, but rivals such as the Panasonic TX-L32E6B and Sony KDL-32W654A offer a more streamlined and elegant experience. There’s also the option to use LG’s Magic Remote with the TV, even though it doesn’t come packed with the 32LN575V. It supports voice control, too. LG’s free control app (available for iOS and Android devices) shares the similar pink-themed interface of the TV’s menus. It’s a decent piece of software, with responsive touch commands and a free-form cursor pad (which admittedly takes a few goes to get used to). There are basic controls and hotkeys for smart features, too. While it can be a bit fiddly to use at times, you can view the current TV programme you’re watching on the smartphone, and can browse through channel lists and pick a programme to watch on the TV - which can be a simpler experience than using the TV’s on-screen guide. One nifty little feature is that you can take screenshots of what’s on the TV screen just by pressing the camera icon – there’s no need to try to position and focus your smartphone’s camera and try to get a decent photo of anything on the TV screen – the app does it all for you. While the LG 32LN575V doesn’t offer the most insightful picture in absolute terms, it’s still a decent screen for the money. The Panasonic TX-L32E6B offers more depth of detail for the same price, but the LG isn’t far off, and delivers a comfortable watching experience overall. And let’s not forget that the host of streaming options and smart features makes this one of the best-connected TVs we’ve seen at this screen size – if you want a small screen that offers a hub of smart activity, this LG is worth a look.